Musaicum Books presents to you this carefully created collection of Po's complete nonfiction works. This ebook has been designed and formatted to the highest digital standards and adjusted for readability on all devices. Poe's writing reflected his literary theories, which he presented in his criticism and also in essays such as "The Poetic Principle". He disliked didacticism and allegory, though he believed that meaning in literature should be an undercurrent just beneath the surface. 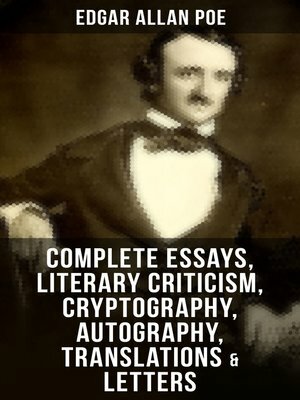 Poe also had a keen interest in cryptography and autography, writing several works on the subject. Table of Contents: Essays The Philosophy of Composition The Rationale of Verse The Poetic Principle Old English Poetry A Few Words on Secret Writing Maelzel's Chess Player Eureka: A Prose Poem Essays on American Literature American Novel-Writing Pay of American Authors American Poetry Essays of Criticism Criticism Drake and Halleck Bryant's Poems The Old Curiosity Shop The Quacks of Helicon Exordium Ballads and Other Poems Hawthorne's Twice-Told Tales The American Drama Marginalia Other Essays The Philosophy of Furniture Some Secrets of the Magazine Prison-House Literary Small Talk Peter Snook Palæstine Some Account of Stonehenge Anastatic Printing Street-Paving Letter to B—— Instinct Vs Reason — A Black Cat Byron and Miss Chaworth Intemperance Cabs A Moving Chapter Desultory Notes on Cats A Chapter of Suggestions Souvenirs of Youth The Head of St. John the Baptist Other Works The Literati of New York Autography A Chapter on Autography A Chapter on Science and Art Fifty Suggestions Pinakidia Omniana Doings of Gotham Letters The Life and Letters of Edgar Allan Poe Biographies Memorandum – An Autobiographical Note The Dreamer by Mary Newton Stanard Edgar Allan Poe (1809-1849) was an American writer, editor, and literary critic, best known for his poetry and short stories of mystery and the macabre. He is widely regarded as a central figure of Romanticism in the United States.